We logged out the Waptus Pass trail today. It’s a two mile hike to get there, then about two and a half miles up to the pass, so round trip nine or ten miles for the day. There’s a prodigious amount of blowdown this year, about three times what’s “normal”. Last winter was more than robust, so storms knocked trees down all over the place. Job security for the trail crew. 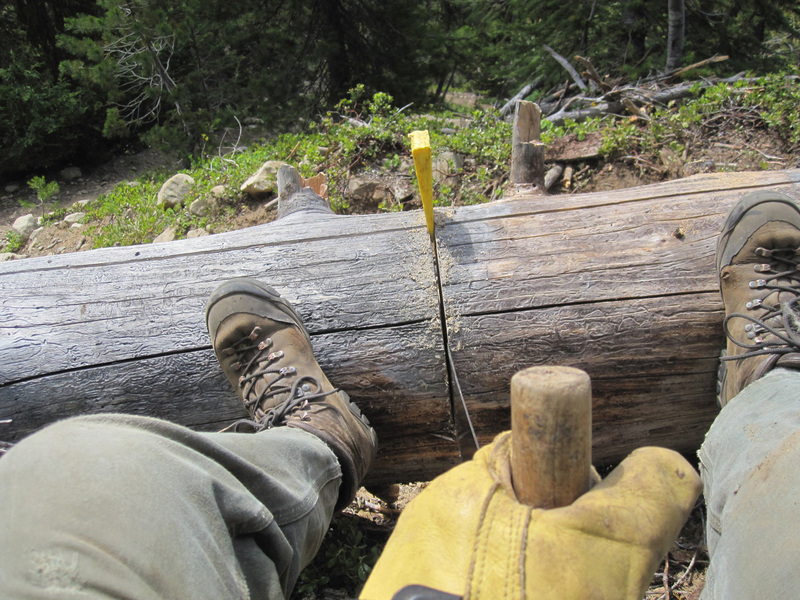 Since Waptus Pass is in the Alpine Lakes Wilderness, we do all the work with hand tools (no mechanized or motorized stuff, according to federal law). Bucking is the act of sawing a horizontal log into pieces. Today we had two of our vintage 5-foot crosscut saws for bucking. They were manufactured by Atkins some time in the 1930s, as far as I can tell. These are fine old pieces of steel the likes of which are made nowhere in the world today. I did some filing on one of them yesterday, and it is quite sharp. These saws have handles on both ends, and are set up for double bucking. The two sawyers stand on either side of the log and pull the saw back and forth between them. This works well on flat level ground. In the mountains, trees rarely fall on flat level ground, so adjustments have to be made. When it’s unsafe for one of the sawyers to be standing on the downhill side of the log, the lower handle is removed and the uphill sawyer single bucks. For this log, I sat on the bank above to pull on the saw. The small yellow wedge is keeping the kerf (the saw cut) open so that the wood doesn’t pinch the saw, allowing it to move freely. “Getting in a bind” is a term that comes from bucking wood. If you don’t read the bind–the forces compressing, stretching, or twisting the log–you get the saw stuck and spend a bunch of your time an energy chopping with the ax to get it out. Using a wedge is simple insurance. This log went easy. I finished single bucking and the two pieces of the log separated with no surprises. Then all five of us sat on our butts in the trail and pushed the log with our legs until it was off to the side. Ate lunch in the shade, listening to a waterfall and looking off toward Three Queens and Spectacle Divide, still all snowy. Waptus Pass itself–not long out of the snow. Black muck in the trail, red heather beginning to bloom, blue sky over mountain hemlocks and yellow cedars, moderate mosquitoes. Boy Scout troop overtakes us on their way to Waptus Lake–the dads beaming at us like we are the heroes of the world, the boys looking like they need a nap. The mosquitoes are going to tear them up. I put the guard on the saw, and shoulder it for the long hike out, sun in my eyes as it makes its way west.